Dominion is one of those games that falls squarely in the category of "I really want to love this game, but I'm not sure that I can". 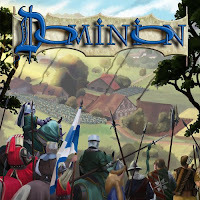 On the face of it, Dominion is a fairly simple card game with the appearance of containing a deeper game within, with potentially clever underlying strategic gameplay. It's ranked very highly on Board Game Geek (currently sitting at Number 6), and this, combined with its plaintive "Buy me! You know you want to!" cry when I saw it on the shelf at the game shop led me to obtain my own copy, despite knowing little else about it. I had already read that Dominion was promoted as a card game with all the fun of a CCG (collectible card game) without all the hassle of, well, constant card collecting. While I've never played a physical CCG before, I have dabbled online with Magic: The Gathering in the past so I knew a thing or two about the game mechanics of a CCG. Having said that, let me make one thing clear. Other than drawing and playing cards from your own stack, Dominion has nothing in common with Magic: The Gathering. The latter is quite complex and can lead to cunningly complicated strategies. Dominion is a wannabe, that doesn't get close to the same level. OK, so it sounds bad right? Well as long as you don't try to compare it with Magic like I just did, then you should find the game enjoyable. Just don't look for anything deep. And that's where Dominion has so far fallen a little short for me. I have, admittedly, only played the game three times (two 2-player games, and one 4-player game) and I'm yet to play with all the different sets. Yet I'm not convinced any particular combination of the game's Kingdom Cards will make this game as exiting as I'd like it to be. A rundown of Dominion's gameplay seems appropriate at this point, so let's do that. The object of this game is to collect cards. An array of cards are placed face-up on the table for all players to purchase during the game. As the game goes on, you'll buy these cards and place them in your deck (every player has their own deck) and use them to purchase more cards. Your deck will keep growing until the the end of the game. At the end of the game, everyone adds the points on any Victory Cards they have in their deck and the person with the most points win. I'll get to Victory Cards shortly, but before I do that it's worth noting how each turn works. It's quite simple really: you get to play one Action from your hand, then you get to buy any card from the table, then you discard your entire hand and draw five new cards. When you run out of cards to draw, you shuffle your discard pile into a new draw deck. Actions are found on what are called Kingdom Cards. During the game you can purchase these on your turn during the Buy phase, place them in your discard pile, and after they get shuffled into your deck, you'll draw them into your hand on a later turn and can then play them during your Action phase. Looking at these, most cards give bonuses like letting you draw more cards into your hand, letting you play more actions, or giving you more coins to spend during the Buy phase. The thing is, only ten of these 25 sets will be available in each game. Ten copies of each card are available for purchase during the game, so once a particular card has been bought ten times, the pile will run out and no one else can buy another copy of the card. This seems to lend itself to a plethora of different options during games doesn't it? Unfortunately, in my limited experience that's not entirely true. There isn't a great deal of interaction between cards (and virtually none between players) and once you hit on an optimal strategy, there will probably be some cards you won't even bother with. I mentioned earlier that you can buy Victory Cards as well. Victory Cards have both good and bad qualities. They are good because (obviously) they give you Victory Points which you need to win. They are bad, however, because once they are in your deck they are useless until the end of the game, and therefore take up valuable space in your hand that could otherwise be taken by a more useful card. By and large, you'll want Provinces and not want Estates. It seems a little counter-intuitive at first to avoid collecting Estates (because they're Victory Points right? ), but if you're going to clog up your hand with cards that you can't use, you're far better purchasing a Province than an Estate. A similar principle applies to Treasure Cards. In order to purchase cards, you'll need coins. As you can see, Treasure Cards come in Copper, Silver, and Gold. Everyone starts with seven Copper cards in their deck, and if you're at all serious about winning you'll need to use these to purchase Silver and Gold cards as soon as possible. Silver and Gold cards are much more valuable than Copper, because when you only have a hand of five cards during each turn, the more coins you have, the better the card you can purchase. You're not going to be able to buy a Province with a handful of Coppers. And there you have it. Each turn you'll have five cards in your hand, and hope that you have either a slew of Silver and Gold coins to buy the good cards, or an Action Card or two to boost your buying power. Buying power, you see, is really what this game comes down to. In order to win, most of the time you'll need more Province Cards than anyone else. Each Province costs 8 coins to buy, so your best bet is to manage your deck in order to maximise the number of times you'll draw a hand of five cards that will net you at least 8 coins. That's why I don't think Dominion is quite as deep, or good, as it appears. Yes, you need to work out which Action cards can benefit you in your quest, but ultimately it comes down to getting as many coins into your hand each turn as possible. Purchasing low value cards (like Estates or Coppers) that don't do much is next to useless. Maybe I'm wrong. Maybe there is a greater depth to Dominion that I am yet to discover. Certainly cards like the Witch or Gardens change things up a bit (and the latter admittedly does encourage stacking your deck with as many cards as you can), and I'm hoping that playing this game more (and perhaps the upcoming expansion) will change my perception. I certainly intend to find out. I think that once you get some good action card combos going - where you can end up with 8 or more cards in your hand, and multiple buys, then this gets interesting. If you only ever have 5 cards, then I think you're limiting your options. As a Magic CCG player, this is "Magic in a Box" with no costly purchase of multiple boosters necessary. I have been enjoying it, and it has the potential to be really quick, 30 mins or so, which allows you to play a number of games in a short period of time. i also like the randomness of the Kingdom cards, and I think this adds to the replayability! I defer to your experience reddyredrooster. I do hope more plays with more action combos will make Dominion grow on me. Having played Magic for 12 years and Dominion about 30 times there really are a lot of similarities, except Dominion is better. With Magic you build your deck ahead of time so other than a sideboard, the die is often cast even before the game starts. If your deck strategy doesn't match up well with the lone your foe is playing it doesn't matter how good a player you are, you will lose. Also the Magic player with the money real money to spend on cards will win most of the time. With Dominion everyone has the same access to cards. You need to develop a strategy on the fly depending on the 10 Kingdom cards available and adjust to what your foes are doing. This makes the playing of the game more critical in Dominion than it is in Magic in my opinion. I like games of all sorts as well as the odd whimsical tangent here and there. Thankfully, my other half, The Giggling One, seems to like them as well. We're holding out for the ultimate in gaming reality: Survivor: Catan. Hexagonal tribal councils are where it's at.